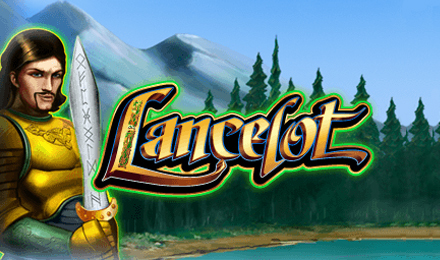 Join the legendary Lancelot and Guinevere at the reels of the medieval themed Lancelot Slots. Battle through this 5-reel, 40-payline past stacked wilds, bonus features and FREE spins to uncover legendary prizes! Travel back to the medieval era to join to battle for legendary riches with Lancelot Slots from WMS at Vegas Spins. This 5-reel, 40-payline game is based on the classic King Arthur tale and you’ll be greeted by the famed Knight Lancelot, his lover Guinevere, Merlin, Excalibur the Sword and more legendary icons at the reels. Sir Lancelot dressed in armour ready for battle, and him and Guinevere are both stacked wild symbols that can trigger exciting bonus feature rounds. So battle through this thrilling game to collect FREE spins, bonus features multipliers and uncover legendary riches!